An editorial in the Clinical Journal of Sport Medicine, derived from an agreed consensus statement from 17 international experts. has recommended that people who exercise in various ways should only drink when thirsty and not aim to top up their bodies with water before, during or after activity. Drinking only when thirsty avoids the risks from exercise-associated hyponatremia (EAH). This is serious reduction in blood sodium, levels which can be fatal. Several people have died from this when running marathons. Drinking only when thirsty, also provides enough fluid to prevent severe dehydration during exercise. 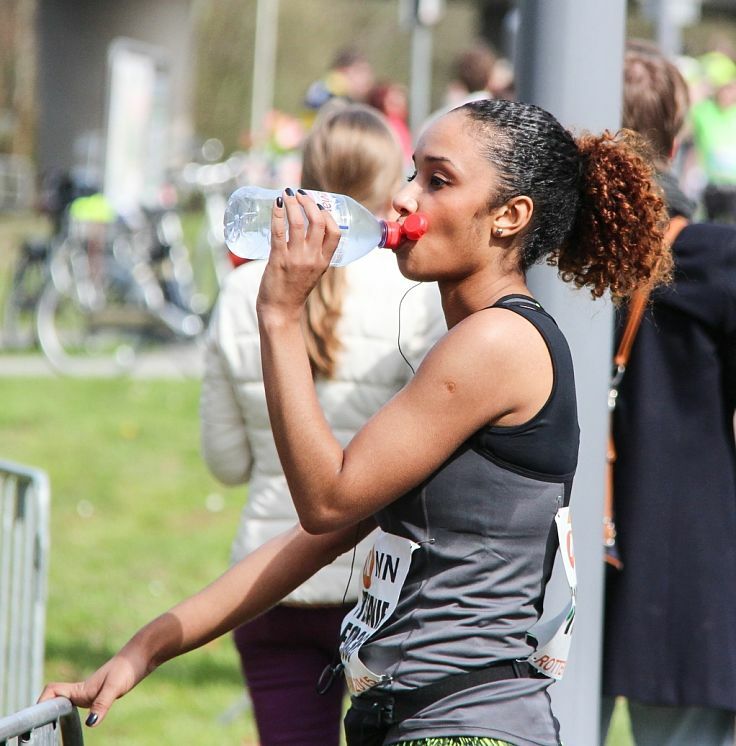 So, over drinking of water has no benefits, even during marathons. The editorial statement also provided a series of recommendations about EAH that trainers, manager, hikers, cyclist, football players, endurance athletes and also casual recreational exercisers, shown be aware of and implement. Participants and support staff should be aware of the symptoms and what action to take. They should also be aware the symptoms of brain swelling can occur during the activity, but also up to 24 hours after the exercise is completed. 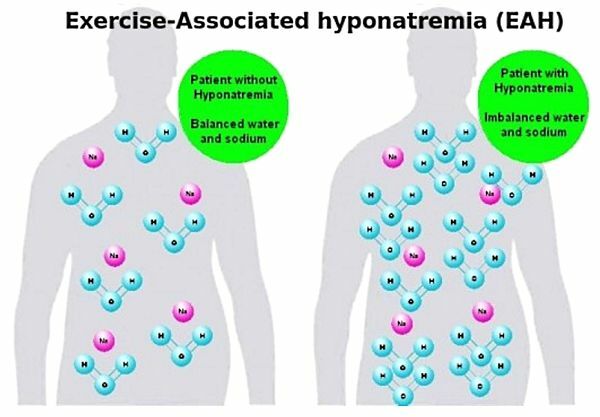 Exercise linked hyponatremia, which is sometimes called "water intoxication", is a potentially serious condition that has caused deaths of marathon runners are other athletes. Drinking too much water, or other fluids, effectively dilutes the amount of sodium in the blood steam triggering swelling of the brain (cerebral edema). The lowering of blood sodium levels can be exasperated by lost of sodium through sweating, especially in hot weather, or in very demanding types of exercise. This can occur during the exercise itself, or up to 24 hours after physical activity. Over-drinking a sports beverage rather than pure water can still trigger hyponatremia. Sports drinks only contain small amounts of sodium, but not enough to reduce the risk significantly. These drinks are mostly water. The relationship betweensodium and potassium salts and health is poorly understood. One large study found that signs of EAH occurred in about 7% of athletes in endurance events: 1% symptomatic and 6% asymptomatic. ► Without immediate treatment, severe EAH can be rapidly cause death. 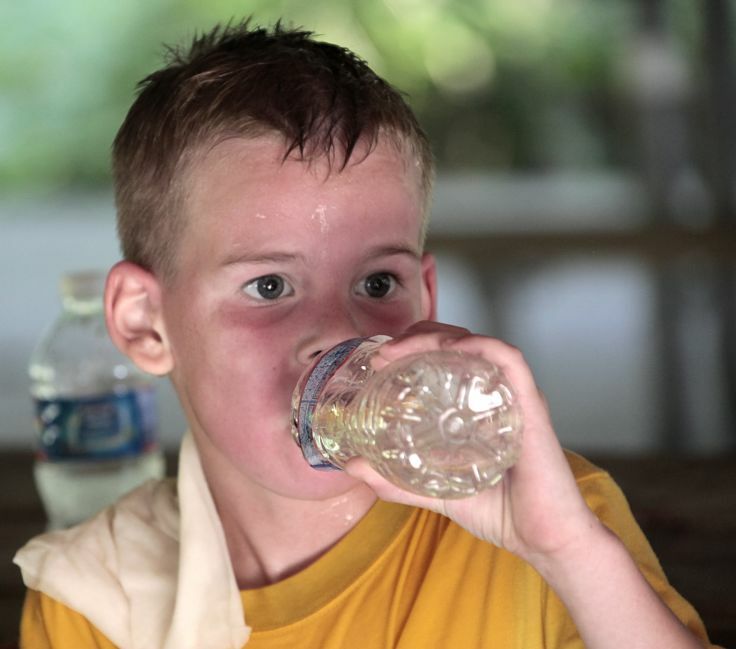 If coaches, parents or informed athletes themselves suspect warning signs of EAH, the most important response is to stop them drinking any more water and sports drinks, and to seek medical assistance. Limiting fluids and closely monitoring participant's condition will usually help them recover from mild symptoms within a few hours. However, any signs of the more severe symptoms, such as confusion or vomiting, requires urgent medical attention. Some athletes may drink too much in an effort to avoid dehydration and an associated decline in performance. Many exercise participants follow past advice that they should "drink before they get thirsty" or to 'drink as often as they can'. Some runners drink water at every watering station along the route so they won't get thirsty. This is fine, but don't over do it - don't over drink water and other fluids. The new advice to "drink only when thirsty" obviously depends on the availability of water at regular intervals throughout long endurance events. This also applies for football and other team events. Players should be able to get water during breaks in play if they are thirsty, rather than having to load up with excess water before the game or at half-time. 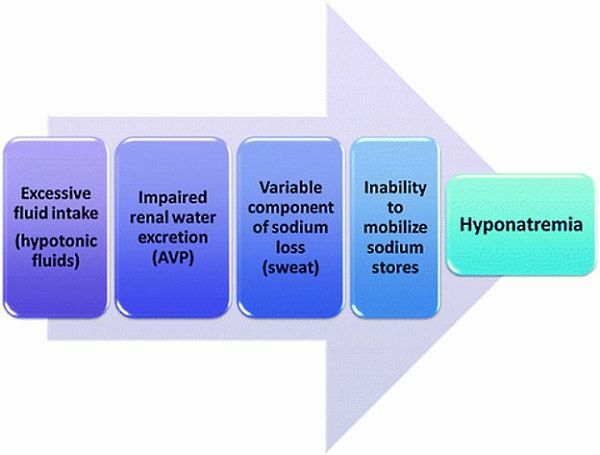 The recommendation provided an assurance that "Drinking when Thirsty" not only prevents EAH, but also prevents a decline in performance due to dehydration. The report highlights the need for education for both exercise participants, managers, administrators and on-field and off-field support staff on the risks of excess water intake and ways or avoid excessive fluid intake. Athletes and coaches must be aware of and take action for balanced hydration before, during and immediately following exercise. Participant and support staff also need to be aware the symptoms my develop up to 24 hours after the exercise, and the actions required if the symptoms develop. The statement also provides a set of recommendations for healthcare professionals who need to be aware of the symptoms, and take action guided by the severity of symptoms. The first reported case of a hiker dying of severe hyponatremia at Grand Canyon National Park has heightened the need to better educate people about the dangers. If left untreated, it can lead to seizures, altered mental and death. Drink regularly to avoid dehydration. But don't over-water as it can be fatal. Learn why here.